At a meeting Wednesday that pitted environmentalists against restaurant owners, the board voted 11-2 to direct IWMA staff to draft an ordinance slated for adoption later this fall. Only North County supervisors Debbie Arnold and John Peschong opposed the proposed ban. Arnold and Peschong argued instead for SLO County to make attempts to recycle used Styrofoam products. Currently, five of the seven cities in SLO County — Arroyo Grande, Grover Beach, Morro Bay, Pismo Beach and San Luis Obispo — have existing Styrofoam bans. Each of the ordinances prohibit restaurants and stores from providing food in Styrofoam containers. The ordinances mandate that businesses provide recyclable, biodegradable or compostable food containers. Likewise, the ordinances prohibit the use of Styrofoam food containers at government facilities and bar government contractors from using them. IWMA staffers are expected to draft an ordinance that would extend these rules to the North County cities of Atascadero and Paso Robles, as well as to the unincorporated areas of the county. On Wednesday, supporters of a countywide ordinance argued during public comment that Styrofoam cannot be recycled. Representatives of local restaurants said a Styrofoam ban would be very expensive for their businesses and make their operations difficult. When the board discussed the proposed ban, Arnold objected to a claim by IWMA staff that Styrofoam food containers can be detrimental to human health and potentially carcinogenic. “Polystyrene food and drink containers have been shown in studies to leach this potentially carcinogenic chemical into food and drinks when heated or when coming into contact with hot foods,” IWMA staff stated in a report prepared for Wednesday’s meeting. Arnold said, based on her research, she believes it is inaccurate that Styrofoam food containers are carcinogenic. 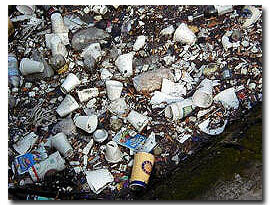 Both Arnold and Peschong noted that 60 agencies in California recycle Styrofoam. In arguing for a recycling program, rather than a ban, the two supervisors also noted that most Styrofoam waste comes from mailed packaging. IWMA manager Bill Worrell was unable to answer questions about Styrofoam recycling because he lacked knowledge. Waste management staffers will likely return to the board with a draft of the ordinance at a Sept. 12 meeting. If so, final adoption of the countywide Styrofoam ban could occur when the board meets on Nov. 14. How about a vote to ban wasteful government boards? We have plenty of them.